Just so you know, this is not a misprint, and, yes, I am spelling the word correctly. When I placed an order for a single copy, the overall total came to …. get this …. $22.22. Believe you me, something like this seldom happens, but when it does you can be sure that I sit up and take immediate notice. 2222 signals a time of change on your path. It means a new beginning, a breath of fresh air. At this time, this is the best validation that I could be receiving. When you make the statement (affirmation) I am happy it is filtered as either true or false every time you make the affirmation. There are many people who struggle with affirmations, for the very reason cited above; truth, be told, I did as well, for the statement will only be accepted as truth when (if) the beliefs that you hold do not contradict the statement. When you ask the question (afformation) why am I so happy? it does not have to be filtered as true or false. Instead, an answer or solution is immediately sought; likewise, evidence to support the answer is also sought. In other words, you mind is looking for reasons for why am I so happy? In essence, the question is the answer. The point of afformations, then, does not lie in finding the answer, but in asking better questions, more empowering questions. 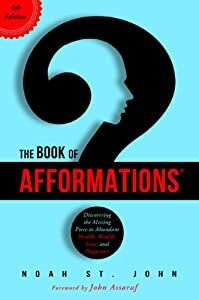 With afformations, you take conscious control of the questions you ask. Once you start gathering answers to your empowering questions, your internal beliefs begin to shift in a most powerful way. This changes what the brain focuses on, which quite naturally changes how you think. When you have been successful in changing how you think, your perspective has changed. This further changes your actions. In changing your actions, you will have changed your life. What a truly empowering way to change subconscious thought patterns (from negative to positive). We all know that the Law of Attraction is activated according to your dominant thoughts, feelings, and beliefs. Almost everything we do is a question that has already been answered. There is a significant difference here. Are you able to see the difference? Better yet, are you able to feel the difference? Mind you, I still make use of affirmations, but in combination with afformations. For example: I expect only the best. Why does doing the things I love (website, blog, researching, writing, editing, publishing, genealogy) bring me more abundance than I ever dreamed of? In addition, availing of my Vision Board gives me reasons to both affirm and afform. In the meantime, feel free to explore the following websites …. In the words of Norman Vincent Peale …. Change your thoughts and you change your world.